The challenge has caught on with notable figures participating in the campaign to raise money for the fight against ALS, or Lou Gehrig's disease. The video, taken in Kennebunkport, Maine, then shows a smiling Laura Bush, his wife, dousing him. She says: "That check is from me I didn't want to ruin my hairstyle." But don't look for anyone to be pouring water over President Barack Obama's head. After all, he is the President of the United States. American presidents, like Bush, are more likely to do something unusual or outrageous for a cause after they have left office. 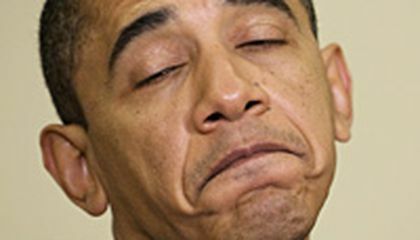 But while he is still president, Obama must maintain the dignity and respect that is part of his office. The ice bucket dare is sweeping the nation and has raised nearly $42 million to support research into Lou Gehrig's disease. The disease attacks nerve cells and can lead to complete paralysis and death. Average life expectancy is two to five years after diagnosis, according to the ALS Association. Other well-known participants include New Jersey Gov. Chris Christie and Ethel Kennedy. The 86-year-old Kennedy family matriarch tagged Obama to participate after recently dousing herself at her family's Massachusetts estate. Mrs.Kennedy knew that the president would be nearby on vacation. Obama participated financially by donating an undisclosed sum, the White House said. Singer Justin Bieber nominated Obama to take the challenge, which has been a boon to the advocacy group. Meanwhile, the State Department has banned participation by U.S. ambassadors and other high-profile foreign service officers. Department lawyers say participation would violate federal ethics rules barring officials from using public office for private gain no matter how worthy the cause. Critical thinking challenge: How have politicians and entertainers made this campaign more effective? Is it part of their jobs or responsibilities? I think that it is to funny for one of the presidents to splash water on their heads. I think that Laura Bush did something her husband, the president, wanted her to do it. I hope that either way the president will pay the check to ALS. 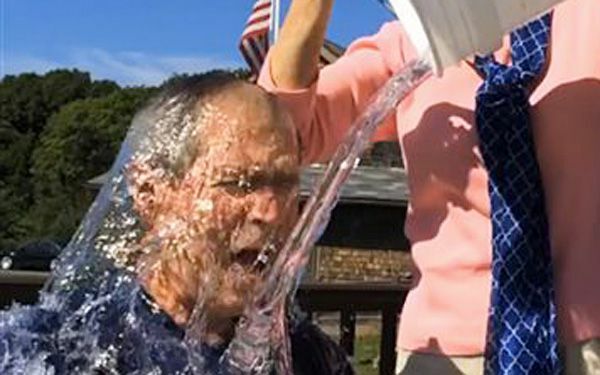 I think that it is funny that President Bush George nominated Bill Clinton even though that he didn't even know that he was actually going to do the ice bucket challenge. Answer: The politicians and entertainers made this more effective by using their rankings. It is part of their jobs to have a high ranking. I think President Obama should have done the ice bucket challenge because if there is something going on like Lou Gehrig's disease, the president should at least show his support on the fundraiser by doing the challenge or donate money to the fundraiser. I also thin this is amazing because the fundraiser has already raised nearly $42 million. With so many people participating, I think the Lou Gehrig's disease association would succeed in the fundraiser because so many people are participating. Answer: Politicians and entertainers have made this campaign more effective by showing themselves doing the challenge which inspires other people in which it motivates other people to get involved in the challenge. I also think it is part of their responsibilities because they promised to help the people in their speech. To prove that, he/she should at least show their support. I think the ASL ice bucket challenge is a good way to support the fight against ASL. At least Obama donated some money to the foundation. He didn't participate because he has to keep his dignity because he's the president, so that kinda makes people think he isn't all for the foundations way to get it around the world and to try to help with ASL. My opinion is I think president Obama should do the ice bucket challenge to show his care in the ASL and plus no matter what you are even if your president everyone should have a little fun every now and then so what about your dignity. I don't believe president Obama is not doing the ice bucket challenge to keep his respect and dignity. If anything the ice bucket challenge will show you have courage and a open mind to new things. If you can do it after you left office you can do it before too. Obama is already being hated by republicans all over for other things. If he does the challenge he'll show the republicans and everyone that he is not better or worse. He just like everyone else. I think he should do it because it is for the case and it is good to have fun for once.It is supposed to be for having fun and getting wet not just righting them a check. I think its good that they are wrasing money for a medical problem. I think its not smart to make the president to do it beacuse it will mess up hiss reprtation. Politicans and entertainers made this campain more effective because pepole looks up to the alot and they do whatever they do sometimes and no it is not there jobs or responsibilities because thier jobs are to be role models for others. It makes it effective because people want to feel how it is like to have ice and water get splashed over you.Its part responsibility because its if you want to do it or if you want to let someone do it. The politicians and the entertainers made the ice bucket challenge more effective by telling other people to do it and that other person would do the same thing until it eventually stops.It is the peoples responsibility too do it because that is the reason why it is a challenge so other people could do it too and if they do not do it then they just broke the challenge.